Small and black. Asus designed the 14-inch P45VJ for small and medium companies. Its Core i5 processor and GeForce GPU deliver a lot of performance. Our review will show whether the laptop can convince. 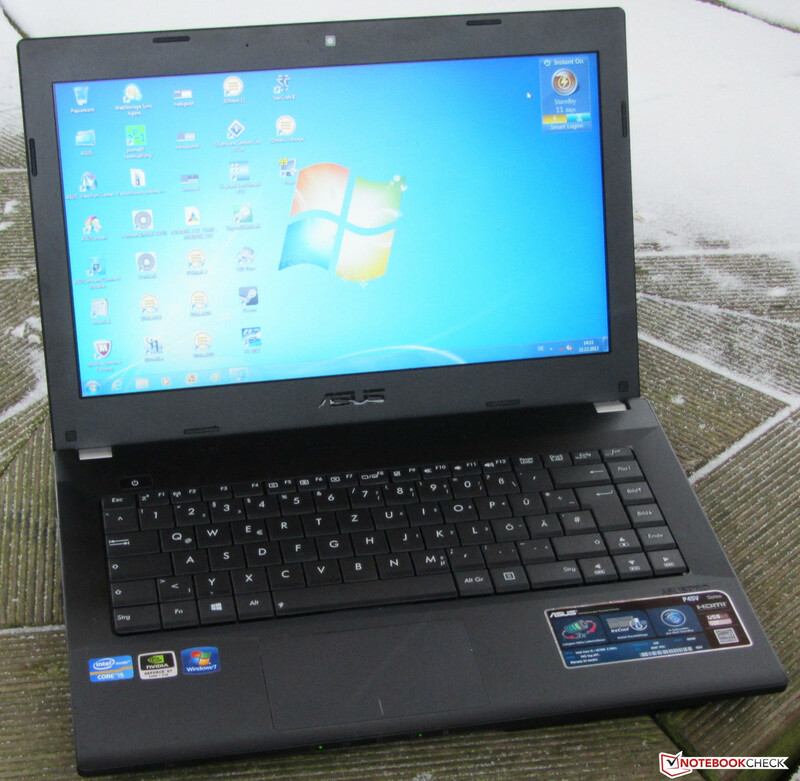 For a while Asus has been trying to break into the business market with the AsusPro laptops. The new 14-inch P45VJ-VO002X has to face up to our tests. We already reviewed the P43SJ predecessor in 2011. Asus equip the small laptop with a Core i5-3210M CPU and a GeForce GT 635M GPU. We compare it to Dell's Vostro 3460 (Core i5-3210M, GeForce GT 630M) and Acer's TravelMate P643 (Core i5-3210M, GeForce GT 640M). 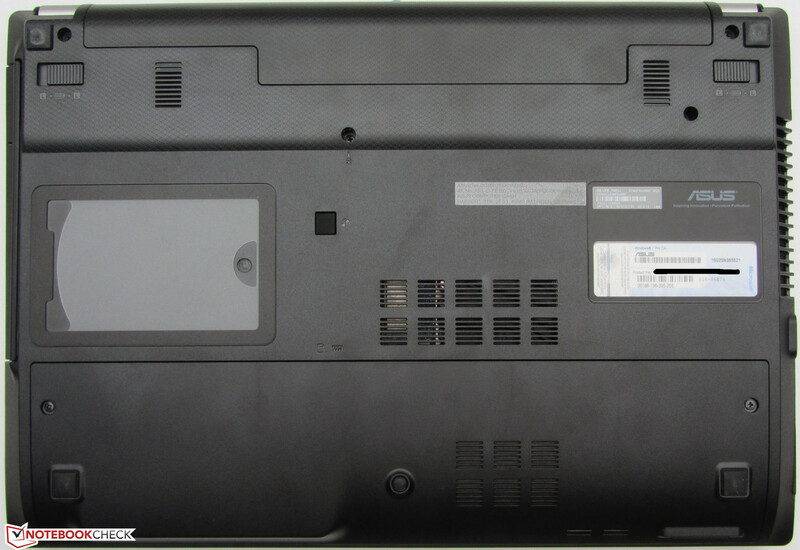 The case of the P45VJ resembles the P43SJ predecessor's and completely consists of matte black plastic. The surfaces are smooth without frills and insensitive to fingerprints. There is only a texture (brushed metal) on the lid. The competition uses more or less higher quality materials. For example, the Vostro 3460's lid is made from aluminum and the TravelMate is completely manufactured from magnesium aluminum alloy. The P45VJ's build quality is solid. The base unit can hardly be pressed down. Only the palm rests yield a little bit. If you pick up the base unit at the front corners, it slightly twists. Just like the P43SJ's lid the P45VJ's can be twisted a little bit too easily and small color shifts show on the display. 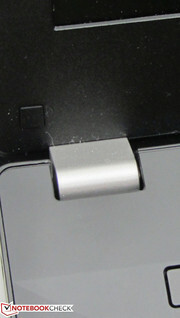 The hinges hold the lid tightly in place and allow one-handed opening. The P45VJ and the Vostro offer interfaces available in many notebooks today. There is only a single difference: the Vostro comes with four USB interfaces (4x USB 3.0) while the Asus only houses three (2x USB 3.0, 1x USB 2.0). Neither of them can keep up with the TravelMate which also features an Express Card slot and a docking port. Left side: power-in, Gigabit-Ethernet, VGA, HDMI, 2x USB 3.0. Right side: Kensington lock slot, DVD burner, USB 2.0, mic, headphones. Front side: card reader (SD, SDHC, SDXC). A Gigabit Ethernet chip (RTL8168/8111) from Realtek is responsible for wired communication. 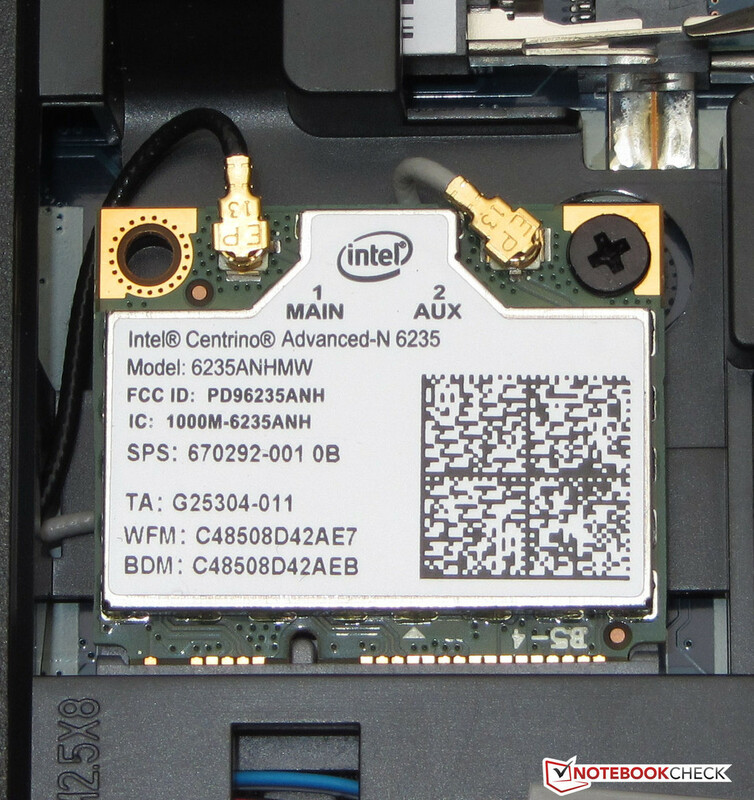 The built-in Intel WLAN Centrino Advanced-N 6235 Wi-Fi module supports the standards 802.11 a/b/g/n. The receiver performance is very good. The Wi-Fi control of Windows displays full performance in close proximity (about 3 m) as well as two floors below the router. In addition to WLAN the Intel module also features Bluetooth 4.0. Furthermore, it also supports Intel's Wireless Display technology, which allows connecting a certified display (e.g. your home TV) to the laptop via Wi-Fi. 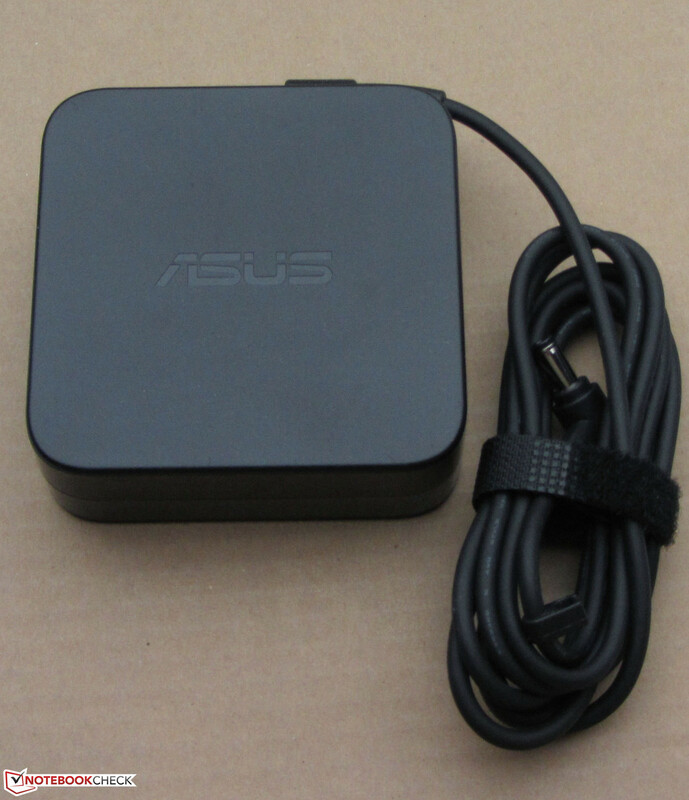 If the display does not support Wi-Fi, you'll need an adapter to use this technology. The Intel software required for a connection is already pre-installed. If you need a UMTS module you should consider the Vostro 3460, which unlike the P45VJ and the TravelMate, is available with this feature. Asus did not forget about video telephony and put an HD webcam into the display frame. Asus deliver the P45VJ with the usual accessories: a thin guide and a booklet with warranty information. 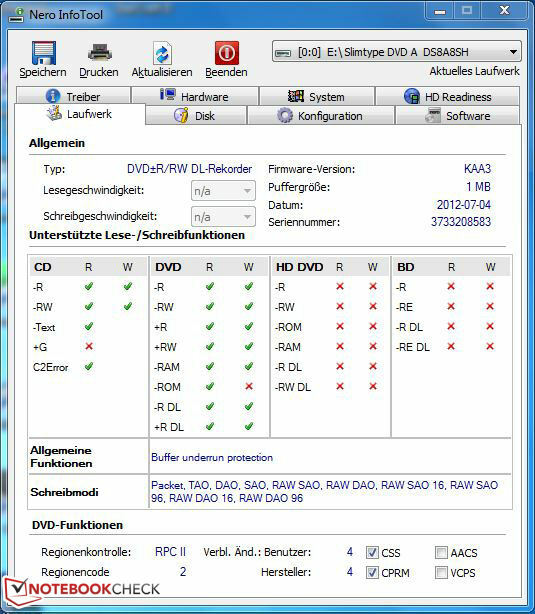 In addition, there is a small Windows 8 guide in the box, which is useful for users who buy a Windows 8 upgrade for the notebook. 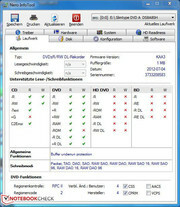 The notebook comes with pre-installed Windows 7 Professional (64 Bit) but a Windows 7 DVD is not included. However, if you replace the hard drive, you'll need one. One of our news articles (in German) shows how it can be created by any user. 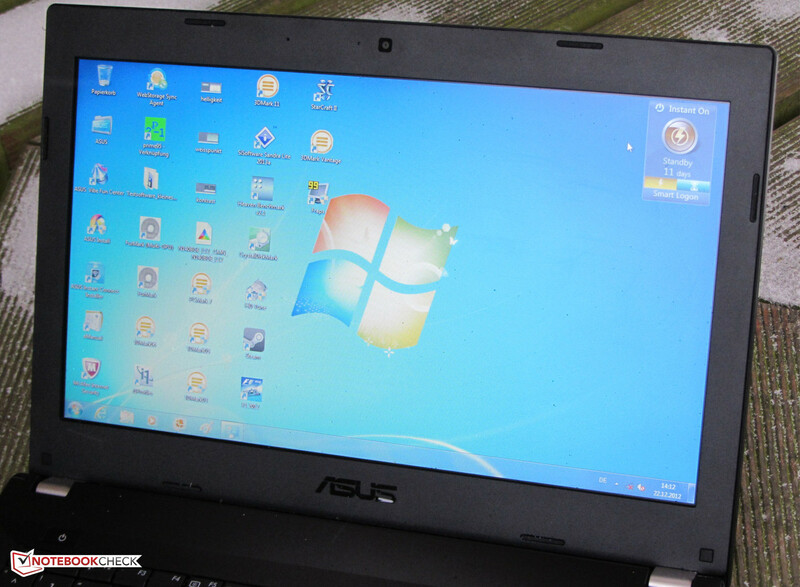 If Windows refuses to boot, the Asus Recovery system allows recovering the factory settings. In order to launch it, press F9 after switching the notebook on. Note: all user data and installed applications will be deleted. 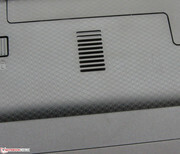 Wi-Fi module, RAM and hard drive are accessible via the maintenance hatch on the underside, but the fan is inaccessible. 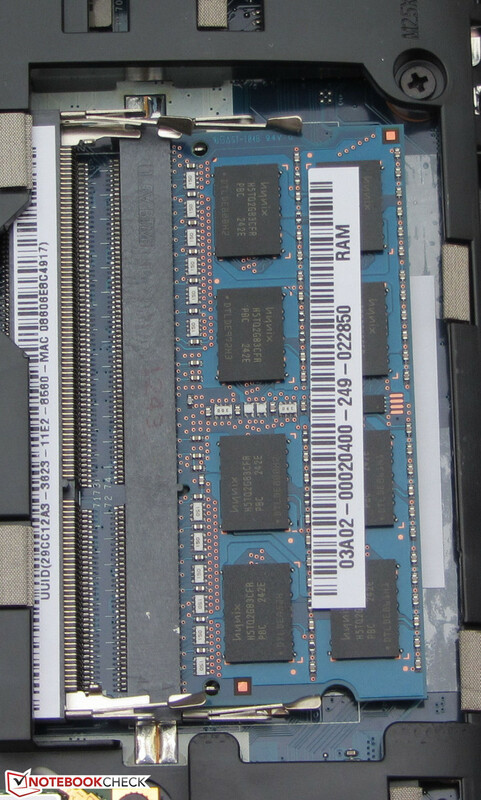 The P45VJ features two RAM slots. Our test sample comes with 4 GB RAM. If you want to double RAM capacity you need to buy a module for about 15 to 20 Euros (~$20 to $26). Replacing the hard drive is easy. Simply loosen the screw and pull it out. Screw the cage to the new drive, insert it and tighten the screw. 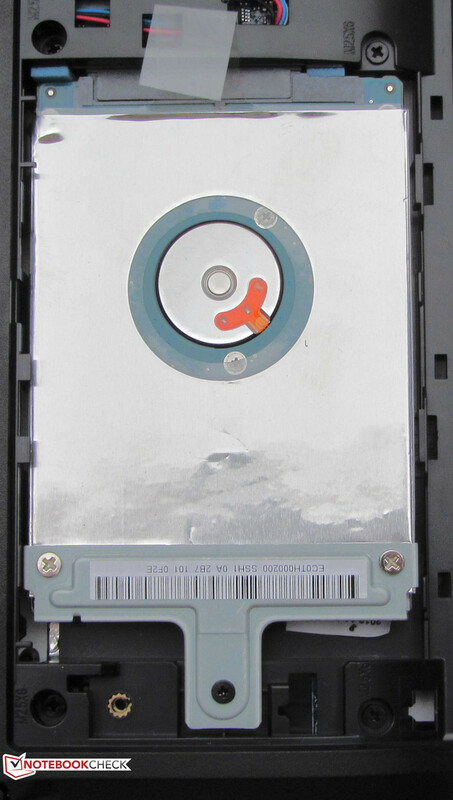 Attention: Asus use a drive with a height of 7 mm, so usual hard drives that are 9.5 mm high won't fit. Asus offers a 24-month warranty. Owners of the TravelMate P643 have the same scope of warranty while the Vostro comes with a one year or two year standard warranty, depending on the point of sale (directly from Dell: one year; other shops: two years). 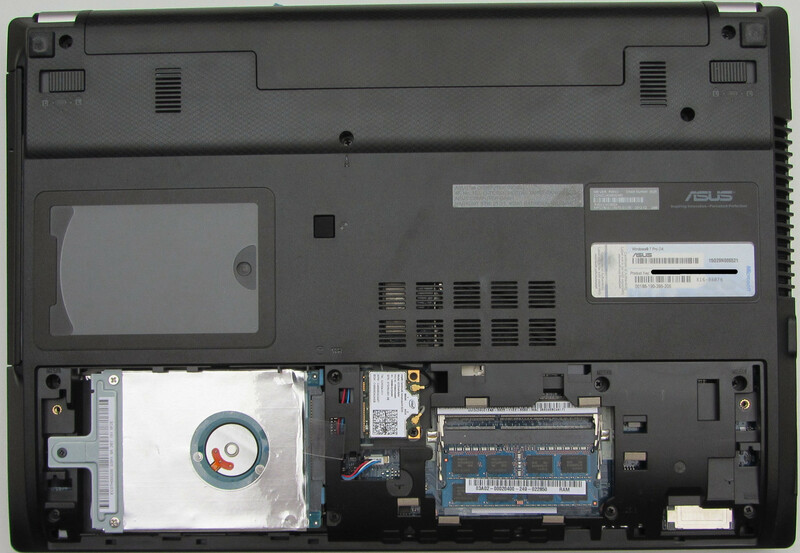 The warranty of the Asus computer can be enhanced to three years on-site service for a surcharge of about 120 to 150 Euros (~$160 to $200). However, it has to be bought and activated within 90 days after the purchase of the laptop. 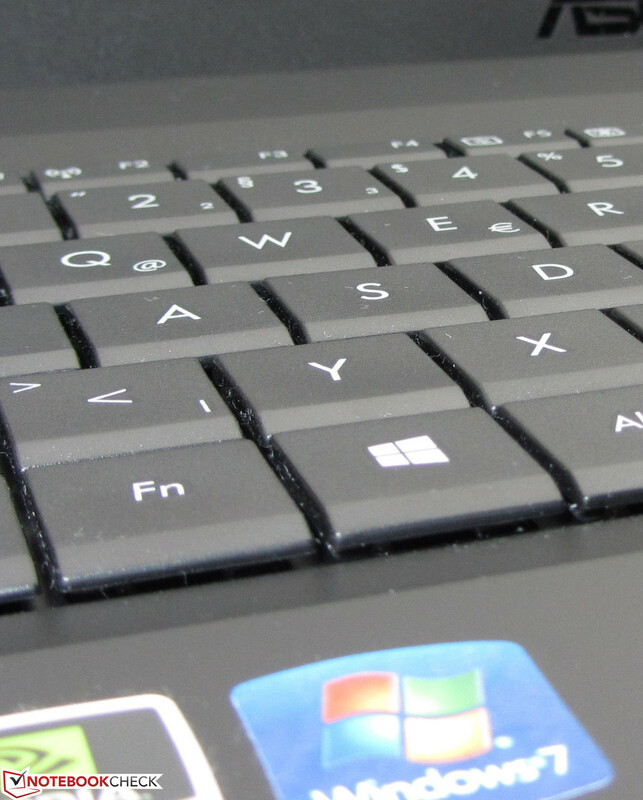 The P45VJ comes with a conventional notebook keyboard. The main keys are 17 x 17 mm, but the slanted undersides reduce the finger rests to 14 x 17 mm. The comfortably stiff keys feature a normal travel distance and an easily recognizable feedback. Typing is comfortable and the keyboard sits stably in the case. While typing the keyboard shows only minimal spring. 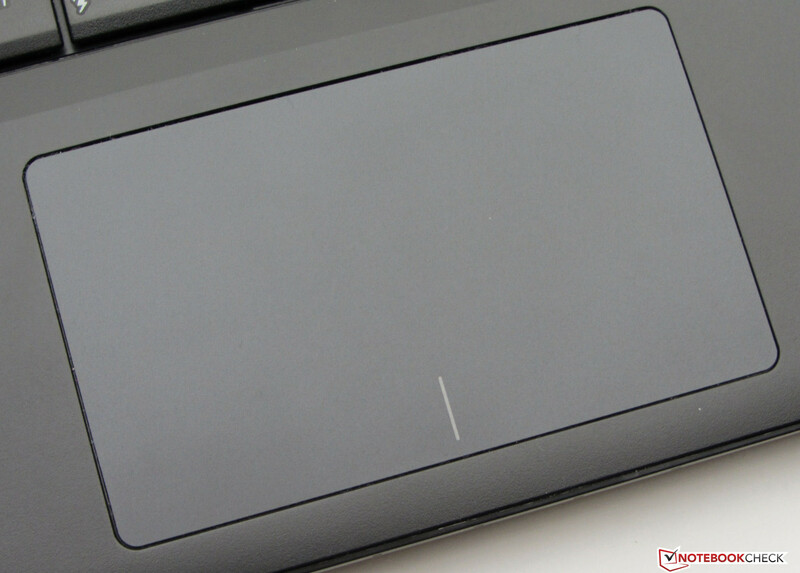 The clickpad of the 14-inch device is 10.5 x 6.1 cm and sufficiently big enough for multi-touch gestures. 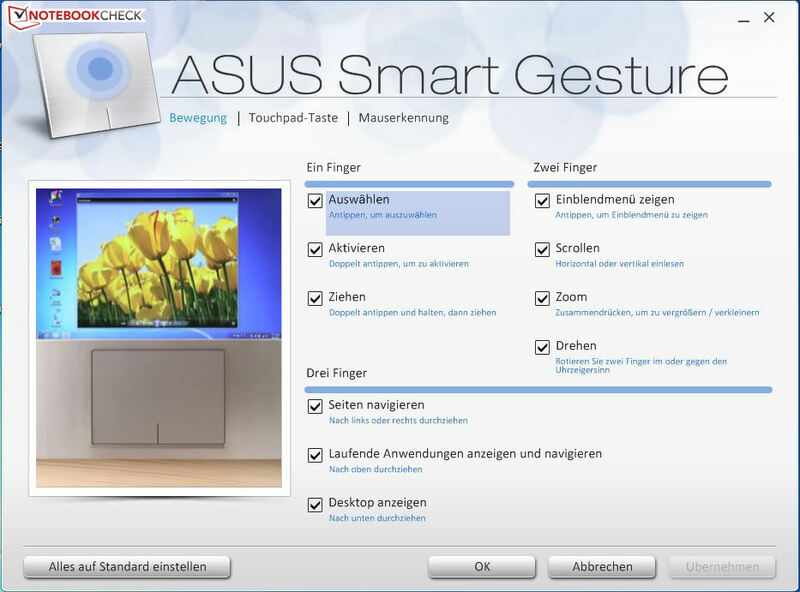 Each gesture can be individually activated and deactivated in the configuration menu. The smooth surface provides decent gliding traits. Sometimes, the pad is too sluggish and a powerful tapping is required for the desired reaction. Unfortunately, the sensitivity cannot be configured. 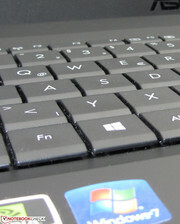 A clickpad is a touchpad without dedicated mouse buttons. Instead of single keys the whole pad is clicked. Nevertheless, it can distinguish left and right clicks: if the pad is clicked in its lower part a left or right click is registered depending on the position. The travel of the pad is short and the pressure point is clearly audible and palpable. Not enough space for a number pad. 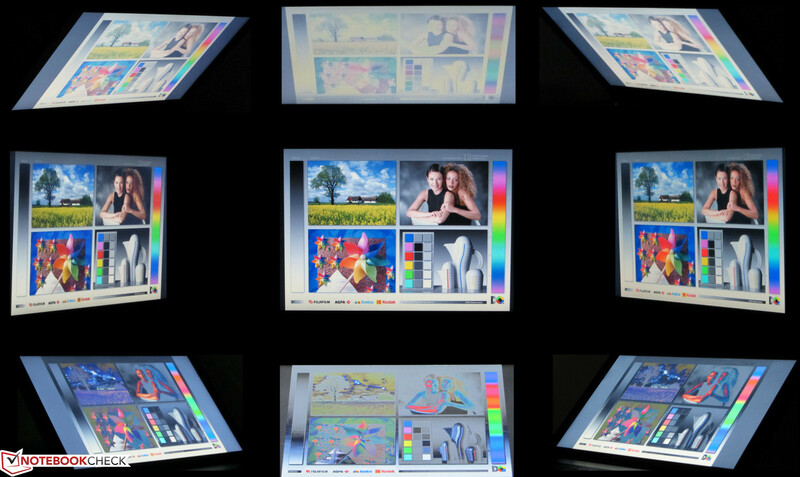 The 14-inch display of the P45VJ stems from Chi Mei and features a native resolution of 1366x768 pixels. Asus do not offer any alternatives. As befits a business laptop the display has a matte surface. The average brightness of 196.6 cd/m² is lower mid-range. The TravelMate (184.2 cd/m²) and the Vostro especially (149.8 cd/m²) show that it can be even worse. 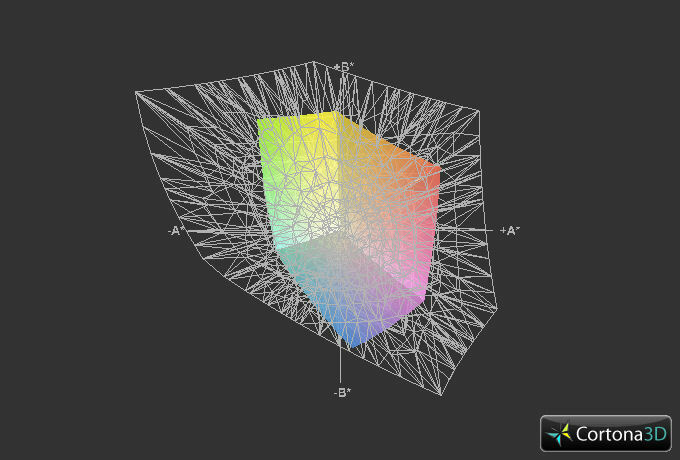 Contrast (242:1) and black value (0.86 cd/m²) of the display also do not convince and are poor. Again the Vostro 3460 (159:1, 0.97 cd/m²) and the TravelMate P643 (138:1, 1.32 cd/m²) perform worse. None of the three displays is able to display deep black. Furthermore, the Chi Mei display can neither cover AdobeRGB nor sRGB. The brightness of the display barely suffices for outdoor use because it has a matte surface, but you should avoid too bright an environment. In terms of viewing angles the Chi Mei display is standard fare: if the viewing angle moves in a vertical direction the images quickly deteriorate. The viewing angles are wider in a horizontal direction. 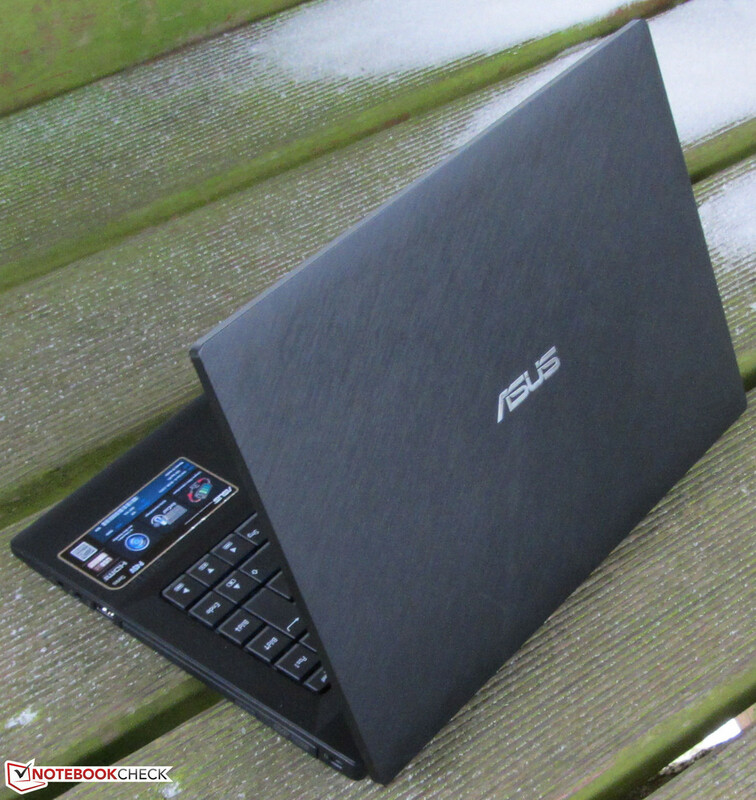 Asus have designed a small and mobile notebook for business users with the P45VJ. However, it also does well in home use. The Core i5-3210M processor and the GeForce GT 635M GPU inside can provide for a lot of performance. Usual fields of applications like text processing, internet communication and video playback are no problem for the device. The Asus computer can also run current computer games without stuttering. At the time of writing, we could not find any other models of the P45VJ series. 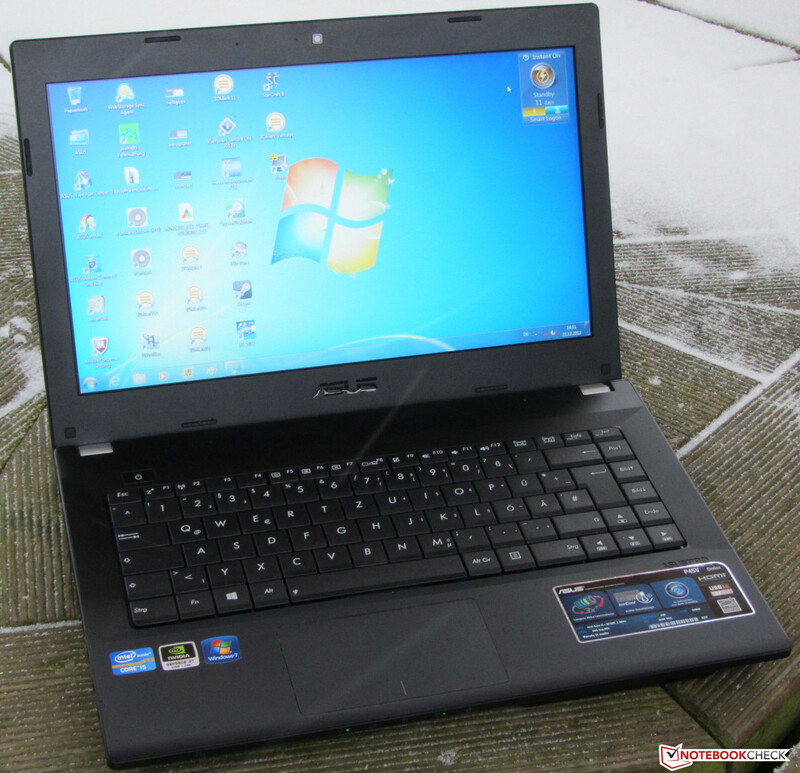 Asus equip the P45VJ with an Intel Core i5-3210M dual core processor. The CPU belongs to Intel's Ivy Bridge series and clocks at 2.5 GHz. 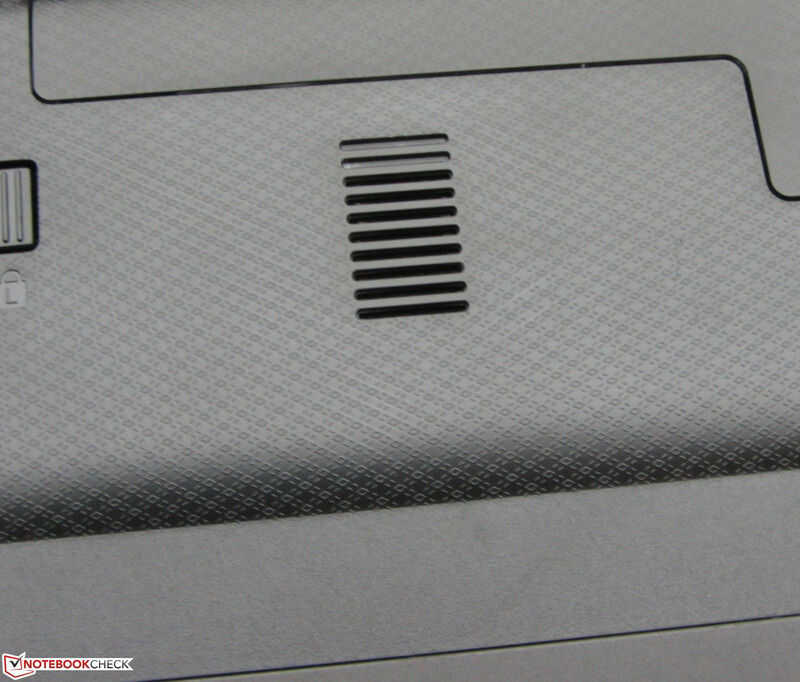 The Turbo can increase the clock up to 2.9 GHz (both cores) and 3.1 GHz (single core). During the Cinebench tests the processor runs at full speed (2.9 GHz). The three competitors are on par in the CPU benchmarks. This is no surprise as the three laptops use the same Core i5-3210M processor. In the GL tests the results of the P45VJ (GeForce GT 635M) and the Vostro (GeForce GT 630M) are rather similar. The performance of their GPUs does not differ much. Due to its more powerful GPU (GeForce GT 640M) the TravelMate can outperform the competitors. The system works smoothly, reacts swiftly to inputs and launches programs quickly. The total result in the PCMark 7 benchmarks confirms our subjective impression. The TravelMate (Core i5-3210M, GeForce GT 640M) is about on par with the P45VJ, while the Vostro 3460 (Core i5-3210M, GeForce GT 630M) performs significantly better. The reason is easily discovered: the hard drive of the Dell is supported by a fast SSD cache. The 14-incher uses a hard drive from Seagate's Momentus Thin series with a capacity of 500 GB and a revolution speed of 5400 rpm. Typically for Asus, the hard drive is partitioned into a recovery partition (25 GB), an OS partition (200 GB) and a data partition (240 GB). A fall sensor should protect from data loss. 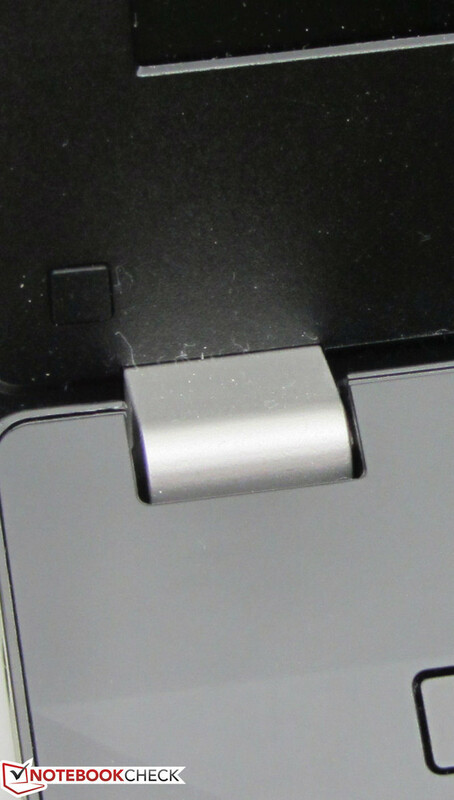 For example, if the notebook falls from the desk, this is registered by the sensor, which instructs the hard drive to park the read-and-write heads. This should prevent damaging the platters and in addition, prevent data loss. CrystalDiskMark reports a read rate of 104.2 MB/s. HD Tune displays an average transfer rate of 85.8 MB/s. These values are excellent for a 5,400 rpm hard drive. A Solid State Drive would also match well with the P45VJ. After all, this is a business notebook, so speed is more important than capacity. Intel's HD Graphics 4000 GPU and a GeForce GT 635M GPU take care of graphics. Both chips support DirectX 11. While the GeForce GPU is used in demanding 3D computer games, the Intel GPU handles everyday use. The GeForce graphics core is mid-range and runs at a base clock rate of 662 MHZ, which can be increased to 797 MHz (GPU Boost). The results of the 3D Mark benchmarks are as expected. 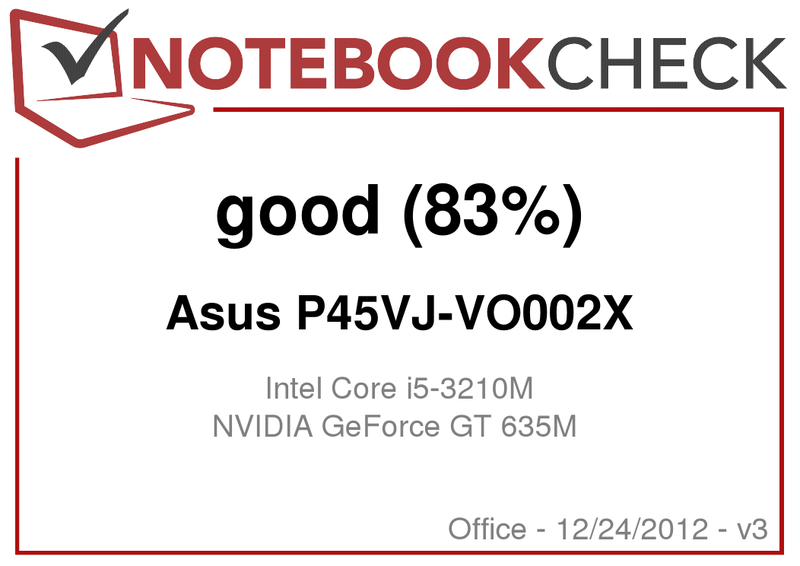 The P45VJ is slightly slower than the Vostro (Core i5-3210M, GeForce GT 630M). The TravelMate (Core i5-3210M, GeForce GT 640M) is significantly faster than the other two laptops, because it houses the strongest GPU of the three competitors. 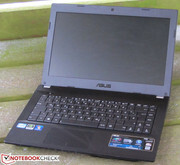 Asus equip the small notebook with a powerful graphics card. Although it is not designed for gamers, it is able to run current 3D games in medium and often also in high quality settings in native resolution (1366x768 pixels). However, because of the small display this will likely not be much fun. Connecting an external screen or TV is recommended. Despite powerful components the P45VJ works rather quietly overall. While idle we measure a noise level of 30 to 31.9 dB. 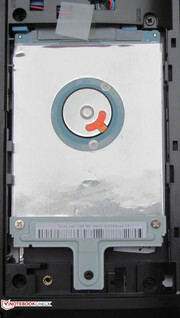 The fan is often deactivated and only the hard drive is audible. Neither the Vostro (36.6 - 39.9 dB) nor the TravelMate (32.4 - 32.4 dB) can keep up with these decent values. If the DVD drive is used the noise increases to 35.6 dB. With 39 dB in each load scenario, the P45VJ neither gets too loud during our stress test (Prime95 and Furmark) nor under medium load (3D Mark 06). The Vostro (46 and 45.4 dB) and the TravelMate (43.5 and 43.4 dB) are outperformed again. While idle we measure temperatures between 27.2 and 33.8 °C. These values are absolutely alright. Under full load the P45VJ's temperature moderately increases to 29 to 46 °C. It is possible to use this notebook on the lap in every load scenario although it is not comfortable under full load for a long time. With 41.8 °C, the left palm rest is a little bit too warm. The Vostro and the TravelMate get even warmer than the Asus in each of the scenarios. During the stress test (Prime 95 and Furmark simultaneously run for at least one hour) the CPU works at full speed (2.9 GHz). However, the Turbo of the GPU is only activated for about one minute (797.3 MHz) and falls to the base clock rate of 661.5 MHz afterwards. 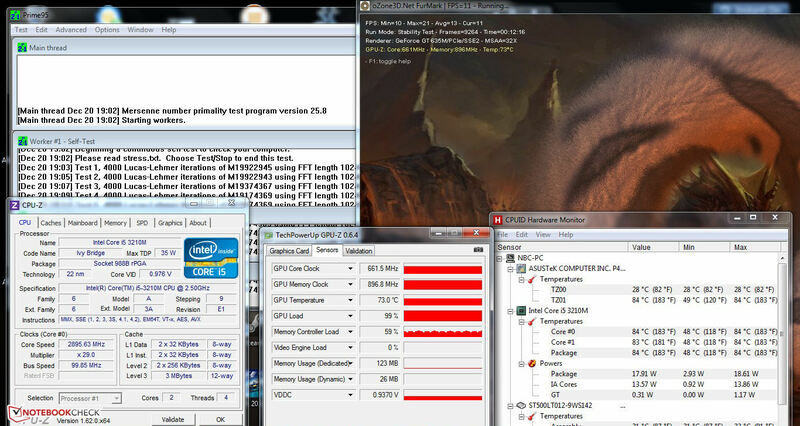 On battery, the CPU clocks at 2 GHz during the stress test, while the GPU runs at 661.5 MHz. The CPU temperature leveled off at 83/84 °C in mains operation. (±) The maximum temperature on the upper side is 43.3 °C / 110 F, compared to the average of 33.9 °C / 93 F, ranging from 21.2 to 62.5 °C for the class Office. (-) The palmrests and touchpad can get very hot to the touch with a maximum of 41.8 °C / 107.2 F.
(-) The average temperature of the palmrest area of similar devices was 28.2 °C / 82.8 F (-13.6 °C / -24.4 F). The stereo speakers of the notebook are on the underside of the device and deliver a thin sound, which lacks bass. Speech is clearly audible. By using external speakers you can significantly improve the listening experience. The P45VJ is very frugal while idle and demands only 6.5 to 10.8 Watt. Again, our test device performs better than the Vostro (9 to 14.9 Watt) and the TravelMate (8 to 11 Watt). 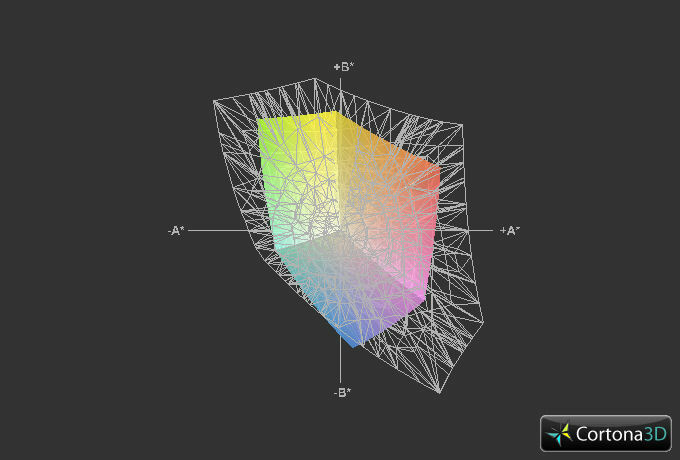 During medium load (3D Mark 2006) the three competitors do not differ much. The Vostro (66.6 Watt) and the P643 (58.5 Watt) require less energy than the P45VJ (68.8 Watt). Under full load (Prime95 and Furmark) the powerful components of the P45VJ become apparent. 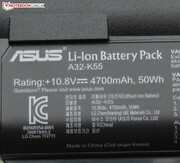 Its power consumption of 86.7 Watt notably exceeds that of the competition: Acer: 60.8 Watt; Dell: 64.4 Watt. A single battery charge is sufficient to operate the P45VJ for 8:21 h while idle. The Vostro 3460 only achieves 5:44 h. With a runtime of 9:40 h the TravelMate P643 outperforms both. The idle scenario is checked by means of the Battery Eater Reader's test with minimum brightness, active energy saving profile, and deactivated WiFi modules. In our load scenario the Asus computer runs for 1:34 h compared to the battery runtimes of the Vostro (1:15 h) and the TravelMate (2:03 h). In our load scenario the Battery Eater Classic test is executed with maximum display brightness, high performance profile and activated Wi-Fi modules. The WLAN test ends after 4:43 h - a decent result. The Dell only achieves 3:52 h. Here the TravelMate runs longest with 6:05 h. In this test, web sites are automatically loaded in 40-second intervals. 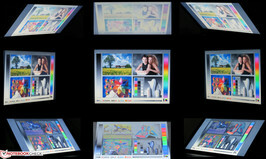 The energy saving profile is active and the display brightness set to about 150 cd/m². DVD playback stops after 4:36 h. Again the Asus performs better than the 3460 (3:22 h) and worse than the P643 (4:58 h). The DVD test is run with active energy saving profile (or higher, if the DVD does not play smoothly), maximum display brightness and deactivated Wi-Fi modules. It's not surprising that the TravelMate wins the battery life tests as it comes with the biggest battery (66 Wh). 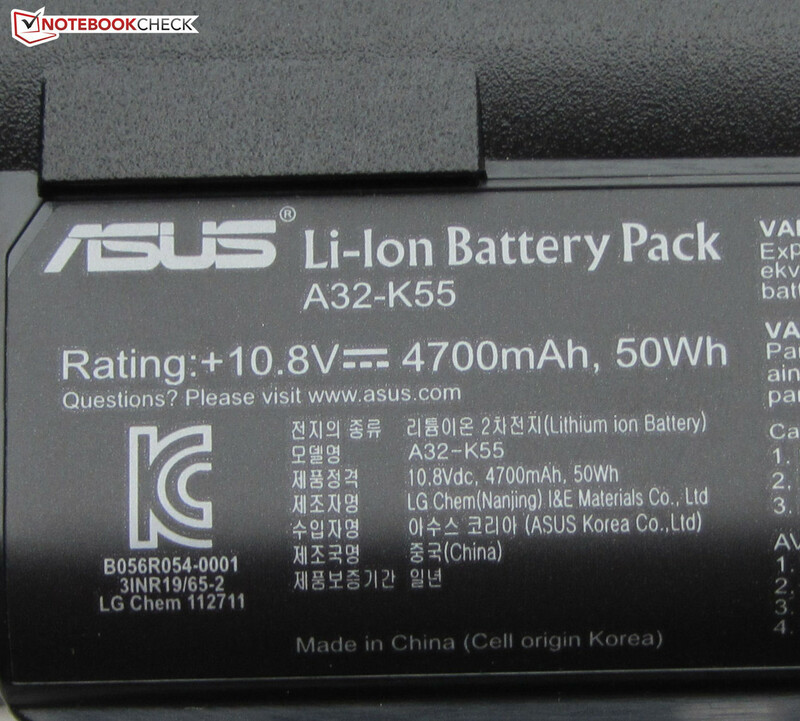 The battery capacity of the Vostro and (48 Wh) the P45VJ (50 Wh) are quite similar. The Asus P45VJ convinces with a decent system and multimedia performance, a quiet system noise and moderate heating. In addition, the decent battery runtimes deserve mentioning. After all, it is a business laptop. The cons are its poor display and high price. Asus demand about 800 Euros (~$1068). That's quite a lot for this laptop. A price about 100 - 200 Euros (~$133 - $266) lower would be more appropriate. 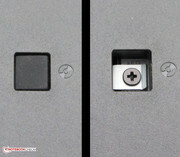 However, Asus offer saving options. 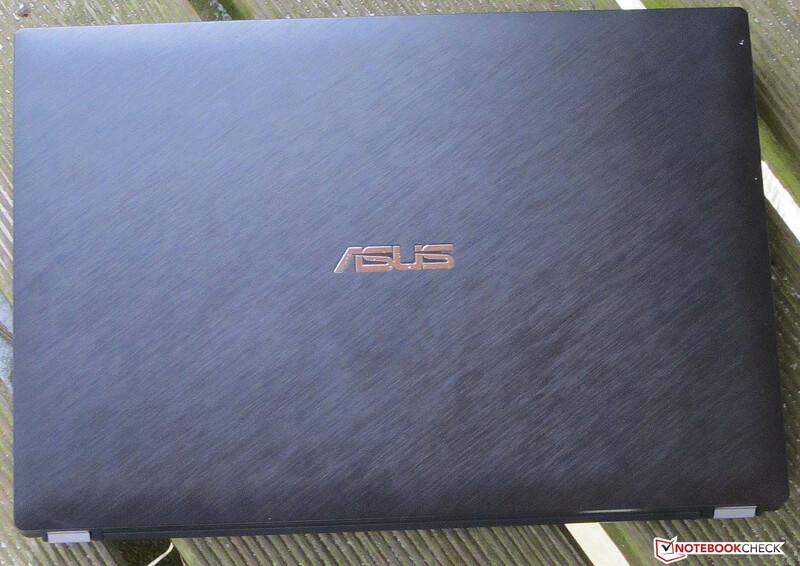 If you can do without a GeForce GPU and Core i5, you can go for the Asus B43E, a fully fledged 14-inch business notebook with docking port, TPM, eSATA and Express Card slot for about 620 Euros (~$828). The Vostro 3460 is a good choice if you prefer uncommon colors, as it is available in silver, red and copper. Furthermore, Dell offer a lot of configuration options. In addition, the Vostro is significantly cheaper than the P45VJ: a model with a Core i3 CPU and GeForce GT 630M GPU costs notably less than 700 Euros (~$935). Without the GeForce GPU a price below 500 Euros (~$668) is possible. Those who require the longest possible battery runtimes, business functionality like docking port and TPM, and appreciate high quality materials (case made from magnesium aluminum alloy), should go for the TravelMate P643. 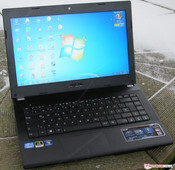 Besides that, the TravelMate delivers the best multimedia performance as it features a GeForce GT 640M GPU. Typing is comfortable on the keyboard. Each multi touch gesture can separately be turned on or off. Small and handy - the P45VJ. ...and has a capacity of 50 Wh. The power adapter weighs 315.7 grams and delivers a maximum of 90 Watt. The Wi-Fi module has two antennas. It's easy to replace the hard drive. The P45VJ comes with two RAM slots. It's easy to remove the maintenance hatch. After you have removed it, you can take out the drive. The screw of the DVD burner is beneath the rubber plug. The hinges hold the lid tightly in place. The device's computation power is decent. The decent system performance and battery runtimes. 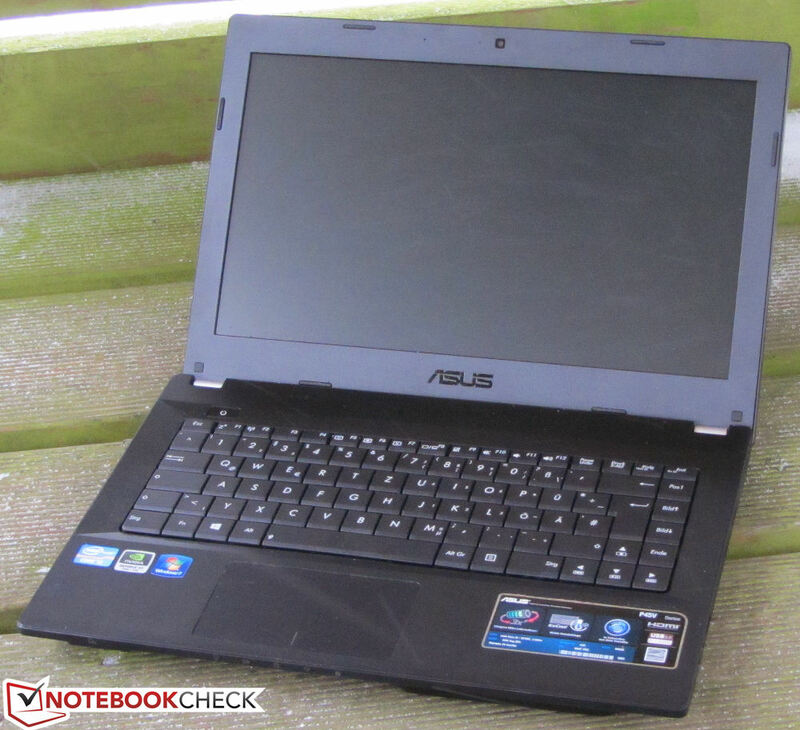 Asus pack a lot of performance in a small notebook, but it's doesn't excessively heat.